Coastal Premier Properties is thrilled to welcome Dennis Boyle and The Boyle Team! Dennis and his team will be working out of our Scripps Ranch office. Having successfully closed several hundred properties in San Diego County over the last 27 years, Dennis Boyle is a proven commodity for buyers and sellers a like. Dennis’ extensive market and contractual knowledge, along with his consistent track record of getting his offers accepted and listings sold to the maximum benefit of his clients, has resulted in a past client loyalty rate that is second to none! With decades of award winning, record setting experience, and hundreds of properties closed within San Diego’s North County and North County Coastal, Dennis has proven strategies and systems to help you negotiate the best possible price for your home. When it comes to the numbers side of the business, Dennis has a unique advantage over the competition. In addition to selling houses since 1990, Dennis Boyle served as a top producing mortgage lender for over 7 years. His ability to calculate loan payments on the spot, as well as his knowledge of current loan programs, and how those programs may effect offers on his listings, or payments for his buyers, consistently helps him bring more transactions together for a successful closing. Click here to contact Dennis! For more about Coastal Premier Properties, visit our website! Coastal Premier Properties is happy to welcome Kristina Rawlins! Kristina will be working in Temecula and Northern San Diego. Kristina Rawlins was born and raised in Oceanside. She attended CSU-San Marcos where she received a BA in Communication. Kristina worked in the hospitality and craft beer industry as an Event Sales Manager where she coordinated weddings and corporate events. Her favorite part about her former job was building relationships with her clients, creating rapport, and being part of special moments in their lives. With those experiences in mind, Kristina brought her talents to real estate. Kristina is very detail-oriented, a great problem solver, and is able to deal with time-sensitive situations with ease. She is compassionate, caring, and really listens to what her clients need. Above all, she absolutely loves facilitating the purchase or sale of a home – there is nothing like handing over keys to a first-time homeowner or a client who has just purchased their dream home. Kristina and her husband, Cameron, live in Temecula with their daughter, Madison. When she is not working, Kristina enjoys being outdoors, reading, spending time with the family, and doing home improvements around the house! Click here to contact Kristina. For more about Coastal Premier Properties, visit our website! 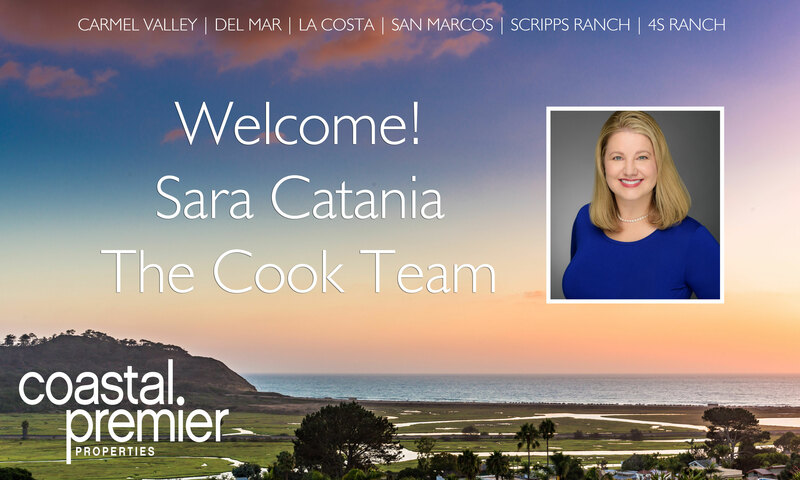 Coastal Premier Properties is thrilled to welcome Sara Catania! Sara will be joining the Cook Team and working out of our 4S Ranch office! Sara Catania was born in Pasadena, CA and grew up in the San Gabriel Valley. She graduated from Cal Poly Pomona with a B.S. in Biotechnology. She also earned a Ph.D. in Experimental Pathology from UCLA. Sara spent five years in Chicago before relocating to the San Diego area where she spent the past nine years in the Rancho Penasquitos/Poway area. Sara’s career in real estate was born out of a passion to help people. She enjoys the challenge of finding the best property for her clients’ needs. As a buyer’s agent for Amy Cook, she works hard to get her clients into their dream homes as quickly as possible. She enjoys entertaining, gardening, music, birdwatching, and spending time with her family and friends. She is also an active volunteer at her children’s school. Click here to contact Sara! For more about Coastal Premier Properties, visit our website!